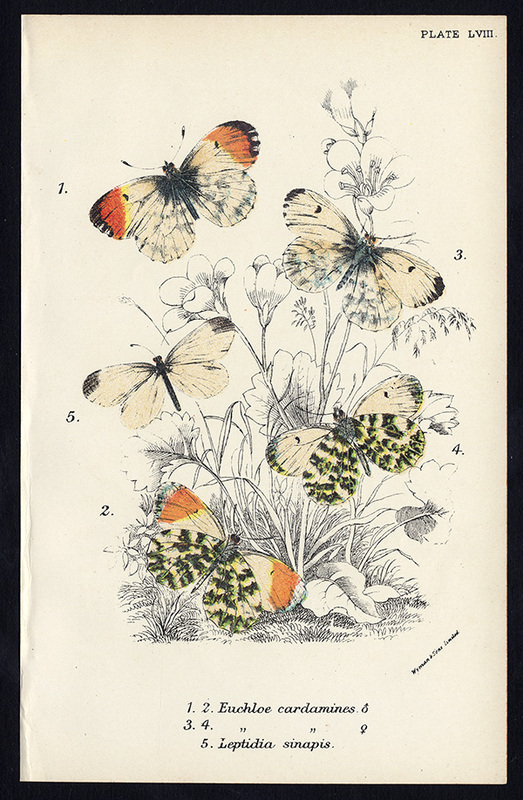 Subject: Plate LVIII, showing various species of butterfly: Euchloe cardamines & Leptidia sinapis. Condition: Very good, given age. General age related toning and occasional light foxing. Please study scan carefully. Size (in cm): The overall size is ca. 11.5 x 18.5 cm. The image size is ca. 10 x 17 cm. Size (in inch): The overall size is ca. 4.5 x 7.3 inch. The image size is ca. 3.9 x 6.7 inch. Description: This attractive original old antique print / plate originates from: 'A Hand-Book to the Order Lepidoptera, Part I. Butterflies, Vol. II', by W.F. Kirby, published in London, 1897. Artists and Engravers: No artist for this series of prints is given. We assume it is W.F. Kirby. The plates were printed by Wyman & Sons of London.